May 24, 2016: Golden Frog signed on to a coalition letter, organized by CDT, which supports the Email Privacy Act (H.R. 699). The H.R. 699 bill is due for markup in the Senate on May 26, and in advance of the markup many businesses and groups signed onto the letter supporting the bill as it passed in the House without further amendments. The letter urges “the Committee to pass it immediately and without any amendments that would weaken the protections afforded by the bill.” We will provide an additional update on Thursday once the bill is discussed in the Senate. April 27, 2016: The Email Privacy Act (H.R. 699) passed the United States House of Representatives this afternoon. The bill will now move along to the Senate. This is good news for those in favor of the bill – a broad group that includes privacy advocates, technology companies, rights groups like the ACLU – and Golden Frog! The bill passed unanimously 419-0. April 26, 2016: Golden Frog signed on to a coalition letter supporting the Email Privacy Act (H.R. 699), which updates ECPA. The Email Privacy Act would end ECPA’s “arbitrary 180-day rule,” that currently allows email communications to be viewed without a warrant after a mere 180 days. It would protect email content under the Fourth Amendment, and call for probable cause and warrant for accessing content. You can read more about the bill and see the other signers on CDT’s website. “Data Foundry, Inc and Golden Frog, GmbH are been pleased to have participated with the Digital Due Process coalition leadership in driving discussions to reform ECPA at the federal level. As members of the Internet Infrastructure Coalition (i2Coalition), and the Computer and Communication Industry Assn. (CCIA) our fellow members agree that ECPA must be revised to better reflect the evolution of electronic communications. Most important is the need for a warrant requirement for all government searches of email and other electronic communications, to add consistency to privacy protections. The fourth amendment protects against unreasonable searches and seizures, along with requiring a warrant supported by probable cause, and ECPA should ensure that constitutional guarantees of due process are upheld. April 13, 2016: We are pleased to hear that the House Judiciary Committee just passed the ECPA reform bill unanimously, with a vote of 28-0. Next it will return to the House floor, and then proceed on to Senate. ECPA reform is an important and highly-necessary step in protecting digital privacy for people across the country. 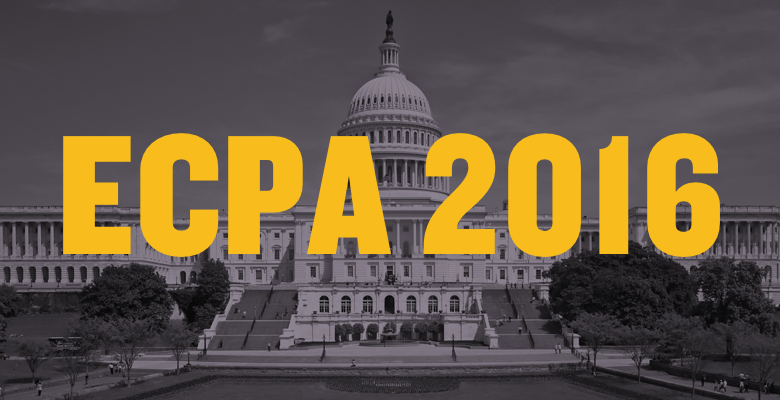 Golden Frog has been supporting ECPA reform and working to get this legislation updated for years, and we’re pleased these efforts contributed to this reform moving forward. April 13, 2016: ECPA is being marked up by the House Judiciary Committee today. At Golden Frog, we are in support of the Manager’s Substitute Amendment to the Email Privacy Act (H.R. 699) which will update ECPA. This Manager’s Substitute was put forth by Chairman Goodlatte. We signed a letter in support of this legislation. The letter was organized by the Center for Technology and Democracy, and we signed alongside many other companies, trade associations and society organizations. You can follow conversations on Twitter using #ECPA, and you can watch the hearing live (starts at 25-second mark). You can also read the House Judiciary Committee release. ECPA sets the rules for when the government can look at information, documents and photos stored in the cloud, and has large implications on digital privacy. ECPA remained unchanged since 1986, despite huge technological advances, causing its reform to be essential. Learn more about ECPA, and view Golden Frog’s Legislative Priorities for 2016.